This huge ram has found something interesting to smell. Rams perform this maneuver whenever they smell things like urine, tree sap, and automobile drippings such as antifreeze and oil. Rams only reach this size in areas where they are not hunted. 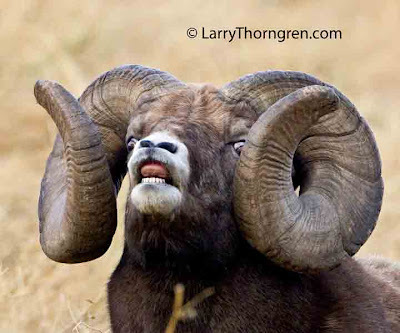 I have been told by outfitters that they have hunters that would pay $250 thousand for the chance to shoot this ram. I always tell them that they can find him on the North Fork of No-Tellum Creek. He lives there with about 60 other rams. Bighorn Sheep are the easiest of all wildlife to approach and photograph. The main secret is to approach slowly and at an angle, and never use a direct rapid approach. I have photographed four individual rams of this size and larger. If you see a bighorn ram of this size, keep his location secret like I do, or he will end up hanging on some hunter's wall. There are unethical sheep hunters that will kill bighorns in national parks and other preserves in their obsessive desire to shoot "A World-Record Ram". I have observed thousands of bighorns in my lifetime and I am convinced that shooting these large dominant rams is harmful to the overall reproductive health of a herd. Hunters and game management agencies preach that taking these large rams does no harm. They like to claim that younger rams can do the breeding after these rams are killed. They are wrong.